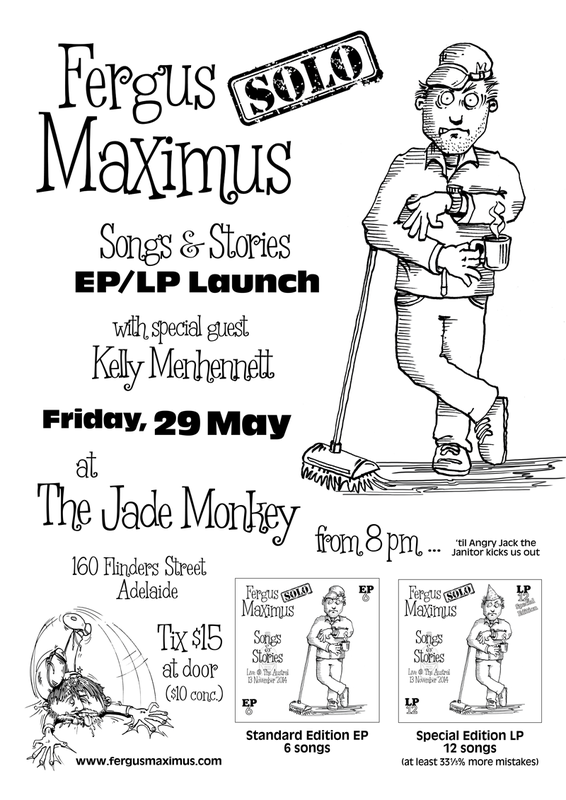 After a fantastic launch show at the Jade Monkey on Friday, 29 May 2015, the “Songs & Stories” EP/LP is now available for purchase. You can try before you buy too — you can listen to the whole of both the EP and LP versions on the Bandcamp site or using their app. Digital and physical copies of the EP and LP versions are available from the Fergus Maximus Bandcamp store and you can also get hold of digital versions on iTunes, Spotify, Deezer, Rdio, Google Play, Amazon and Tidal (and some absurd number of other places around the web). “Songs & Stories” comes in two versions. The standard EP has six songs (11 tracks altogether including all the chatterboxing). The special edition LP has 12 songs (24 tracks including all the chatterboxery). That’s TWICE as many songs and at least 33% more mistakes! 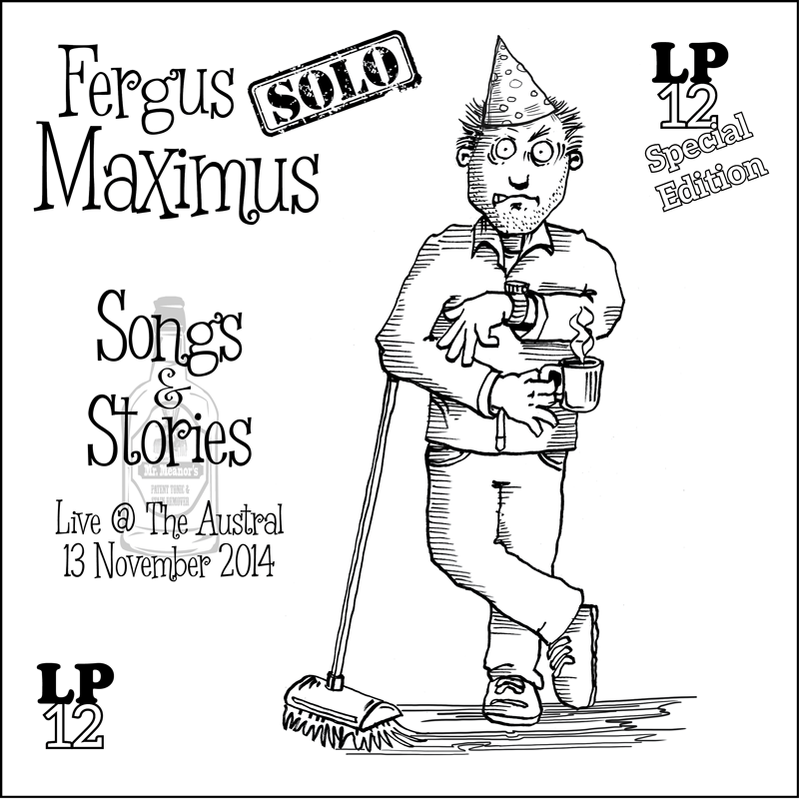 After approximately forever, the debut Fergus Maximus album is about to launch (and Ferg is super-stoked to announce that the evening will start with a special guest set by the wonderful Kelly Menhennett). 2. Noni Espinosa is a terrific sound engineer — the live mix went straight to his hard drive and when Ferg heard it back he realised he had accidentally recorded his first album. There is also a Special Edition LP which has the whole, hour-long show (that has twice the songs and also includes at least 33% more mistakes). Since “Songs & Stories” is a solo release, this will be mostly a solo show but don’t be surprised if some special guests pop up. Quick, put it in your diary now! It’s long enough after the Festival/Fringe madness that you will have caught your breath but before the Cabaret Festival knocks you off-balance again. Tickets will be $15 ($10 concession) and will be available at the door. Tix are also available for pre-order and the EP/LP will soon be available for pre-order too. Email bookings@fergusmaximus.com for more info. This is a song about a bloke called Derek, written for everyone who has ever lived in a sharehouse. And for all those who wish they had. 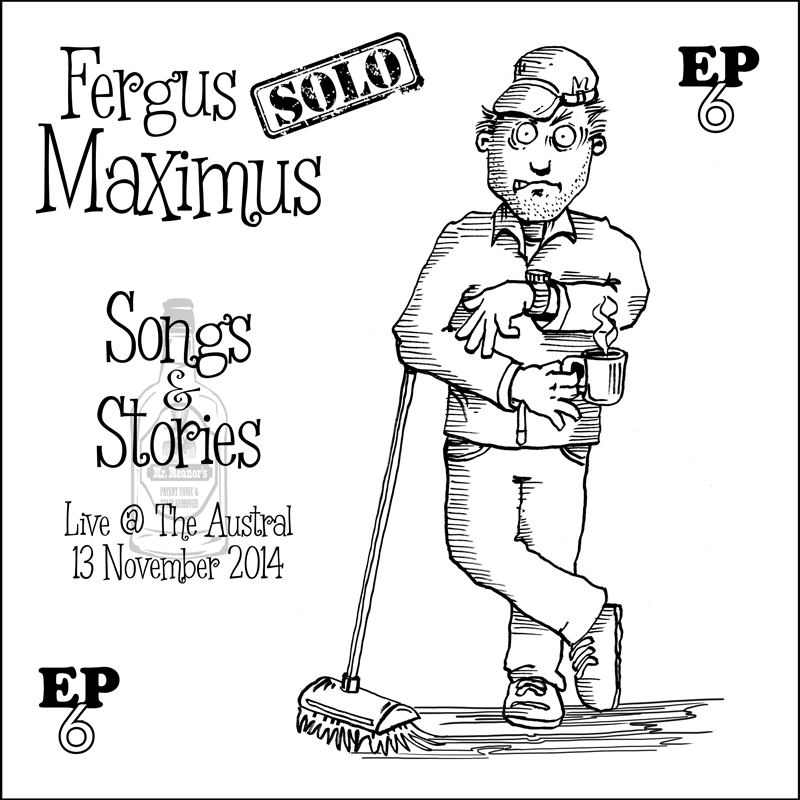 ‘Derek’ is the first official single release from Fergus Maximus and is the lead single from his forthcoming EP/LP Songs & Stories – Live @ The Austral (launching in May 2015). Derek is available on Kicktone and iTunes and CDBaby and pretty much everywhere you might expect to find such things (Spotify and Pandora coming soon). It was recorded live at The Austral Hotel in Adelaide, South Australia on Thursday, 13 November 2014 by Noni Espinosa. Noni did the live mix and recorded it straight to disk and then tweaked the levels a bit and, well, that’s pretty much all that happened. It was mastered by Peter Maher in London (because The Internet). Daniel Ralph and his sister Deborah ran cameras that night and then Daniel used magic and electrons to stitch together the video you see before you. Ferg says that all the above-mentioned people are awesome and great to work with and you should definitely check them out. We had assumed he includes himself in that statement but when we asked him to clarify, he responded with “No Comment” so you will have to make up your own minds. Stumbletrip was the second incarnation of Sideways Glance, the band I started with Grant Shillabeer back around the end of the 20th Century (1998 as best I can figure it). We had added Jamie Harrison on bass for a couple of gigs and had a few rehearsals with a hot girl drummer (she was way too young and gorgeous for us and, sadly, much to busy). In the end Kym Perry came on board as our drummer (he’s now the guitarist for Fergus Maximus and is remarkably and unnecessarily talented in either guise). I’ll write up a proper bio for both bands eventually but that’s not the point of this post. The name Stumbletrip actually comes from Michael Rosen’s wonderful book We’re Going on a Bear Hunt. To date, only one person has made that connection independently. Well, only one person has told me they’ve made that connection (thanks, Jo, you’re an exceedingly well-read legend).